Do you like talking on the phone? Do you enjoy interacting with customers? Do you excel at entering data and scheduling information? Then come volunteer with St. Vrain ReStore. We are in need of administrative volunteers to help with answering phones, returning phone calls, scheduling, customer service, and other administrative tasks. Why Volunteer with us? Unlike many of our other volunteer opportunities, this position would allow for sitting so it's perfect for someone who wants to be involved with St. Vrain Habitat and may be unable to stand for long periods of time. This position is good for a friendly, reliable individual who likes to stay busy. Volunteer with us to make an impact on your local community, meet new people, and learn new skills and/or utilize skills you already have. It's retail with a mission! Orientation and training would be provided. We need someone 3-5 days a week for 3-4 hours a day. Interested? 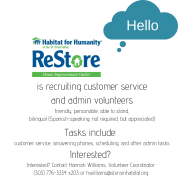 Inquire - Hannah Williams, hwilliams@stvrainhabitat.org or (303) 776-3334 x203.